WOKING Air Training Corps cadets held their annual inspection, with one of the latest recruits getting to meet the Officer Commanding of Squadron 27, that flies Chinook helicopters. Eshan Miah, who has been with 1349 (Woking) Squadron, ATC, for about six weeks, was on parade when Wing Commander Phil Wadlow stopped for a quick chat during the parade, picture. 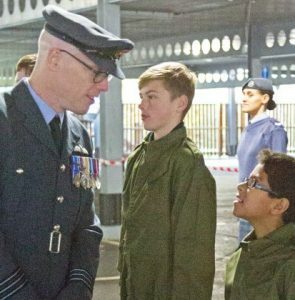 The cadets, who meet at the Hoe Valley Community Centre on two evenings a week, are connected with the squadron based in Odiham, Hampshire, through a former member of 1349 who went there about seven years ago. The link also brough connections with the Worshipful Company of Horners, who have provided valuable sponsorship. The cadets can begin at Year 8 and can apply to stay beyond the age of 18 if they have gained sufficient skills to be able to train the youngsters. There are also adult more senior officers, including the Officer Commanding, Flight Lieutenant Wendy White, who joined the cadets in 1998 and has been in Woking for nearly 10 years. Wendy is a sign language interpreter and said that the other adult staff were from a wide range of jobs, including police officers, firefighters and company directors.